I love that the title of Sunny’s post for this new moon was “Reluctant Beginnings.” The most significant thing that happened on the day of this new moon was a possible cancelation of a flight. I was at the start of my annual pilgrimage to visit my parents who live in Arizona during the winter months. While waiting at gate 11 to board the plane, literally at the time of the change into this Pisces New Moon, what I heard (though not literally) was, “We’re not going to tell you what’s going on…and we’re not sure what we’re going to do…but this flight is on hold…possibly canceled. Check back at 11:00. You might want to check with Customer Service for another flight.” As directed, I went to see what my options were and while waiting in line I heard the announcement, “There’s a gate change for flight 776. Please report to gate 13.” Happy New Moon. The foundation of the mandala has three circles – Three usually speaks to me of the Trinity – a sacred, holy community. The circles are also cut into eight segments – a number I typically associate with the Cosmic Christ and the power of love. 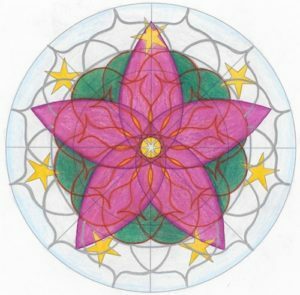 The outer ring has 11 “Petals”, if you will… Wisdom Petals “in the ethers” reach out to the world, infusing all things. The petals in silver, a precious metal, is reminiscent of the chord that connects us to Spirit, and Sky Blue Light for the background of the outer ring lends a sort of heavenly feel to the mandala – as above so below. Seven five-pointed stars dance in this wisdom-circle and speak to illumination, manifestation of the higher good (2+3=5) and perfect completion (7). The next and central circle hold twelve “Kisses”. Like the love they represent, these are unseen and hidden from view, yet are the life-blood of the flower and it’s blue-green (high heart) leaves. The Kisses are outlined in Poppy red – a color I associate with The Spirit. These kisses speak to me of love from the ancestors and the elements and the Divine Beloved that surrounds us and flows through us all. Twelve symbolizes wholeness. The small, central figure is a six pointed star around which the “kisses” dance creating the circle that holds it. Six is the number of home – of being at ease, safe, treasured, and unconditionally loved – a place where we are always welcomed. Sky Blue Light is echoed here and literally jumped out of the jar when I picked it up. Overlapping the entire mandala and encircling the central star is a large five-pointed flower in Magenta or red purple, the color of the spectrum for Pisces and the color of Lent in the Catholic Church. I see this flower as a representation of the one who gazes upon it, the connection to all that is and the blooming that is yet to come. to what wishes to come. This cycle from beginning to end has been about completion, healing and being open to a new way to get where I’m headed… from the gate/plane change on the new moon, to crazy detours mid-month when I went to visit my daughter at Mom’s weekend. Nowhere I went that day was there a direct route. A Frasier episode entitled “The Last Time I saw Maris” during Holy Week, a time when I am typically engulfed in church activities and services, helped calm me and remind me that I left for the right reasons. The episode, seen on Holy Thursday morning no less, brought such peace to my heart – a lovely “coincidence”. I “ran into” one of my favorite people from church who was in town on business while away visiting an out of state friend very recently and was able to communicate and explain my abrupt departure from the parish and how difficult that decision was for me. This visit was extremely healing. I also did a metabolic assessment just prior to this cycle to determine my optimal fat burning zones for physical activity and weightloss and it’s changing the way I workout. Having faith and trust (and a sense of humor and adventure) that all will work out… that all will be given in its appointed time has been a saving grace, indeed, this cycle… even for something as simple as a needed parking space. So, no matter where I was or what was happening, living in the flow of this graced-pace helped me to always feel at home and guided. The Astrological year now completed, I turn my heart to the east and the coming of spring. I am committed to continuing to engage in Natural/Circadian/Feminine Time with Donna Iona Drozda at Wren House Studio. Consider joining me if you feel you would love to live at a more graced-pace. (http://www.donnaionadrozda.com/lifecycle/darkest-before-the-dawn/). I am hopeful and excited for the new adventure of this coming year though I don’t know where the road will take me… of continuing to unearth who I am and who I will become, resting in what is and attentive to what comes my way… of how God is speaking in and through the world and to what is being said. Spring doesn’t pop out all at once after all… it gently unfolds. Happy and Blessed Spring, O Beautiful Flow-er!